An ergonomically styled, all metal bodyshell Gen 1 binocular utilising 2 x high grade V8 Gen 1 tubes. Fitted with two 80mm f1.6 lenses, these offer 3.6x magnification and a 15° field of view. Power is provided by 1 x 3V Lithium CR123A (not supplied) that also feeds the built-in short range Infrared Illuminator. Interpupillary movement is available on this model. A tripod socket is built in to the lower right side of the body. A new compact and lightweight night vision binocular, styled like a roof prism day binocular, utilising a rubber-armoured, all-metal bodyshell. The Corona™ again uses 2 x high grade V8 Gen 1 tubes. Keeping size to a minimum, 2 x 50mm f1.2 lenses have been used that give 2.5x magnification and a 20° field of view. 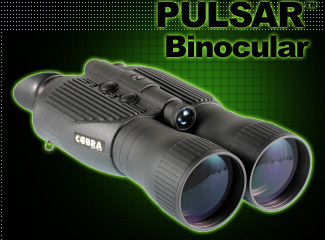 At just 0.5m, minimum focus is very close for a night vision binocular. The unit is powered by 2 x 1.5V Alkaline LR1/MN9100/Type N batteries (not supplied) which also power the built-in short range Infrared Illuminator. An external light sensor helps prevent tube damage from bright light sources. Ergonomic, wrap-around eyecups are fitted as standard to maximise user comfort and minimise glow from the eyepieces. Interpupillary movement is available on this model. 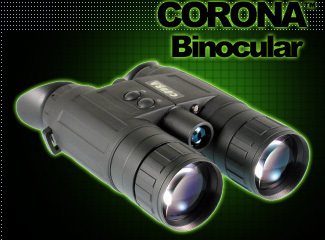 Latest addition to the binocular lineup is this high magnification, rubber armoured, all metal bodyshell Gen 1 binocular utilising 2 x high grade V8 Gen 1 tubes. Fitted with two 100mm f1.6 lenses, these offer 5.0x image magnification and a 10° field of view. Ergonomic, wrap-around eyecups are fitted as standard to maximise user comfort and minimise glow from the eyepieces. Power is provided by 2 x 1.5V Alkaline AA/MN1500 batteries (not supplied) that also feed the built-in short range Infrared Illuminator. An accessory shoe on the top of the unit allows attachment of a high power IR illuminator - either the 7011 150mW or 7012 75mW. A tripod socket/adaptor is built in to the base of the body.